Further to Friday's piece on the new EU Commission posts (described by Nicolas Sarkozy as a "victory" for France, who said the British were the 'big losers') it emerges that Jonathan Faull has been appointed as Michel Barnier's right-hand man as Director General of the Internal Market portfolio. According to PA, Faull will ensure that "the interests of the City of London are understood at the highest levels of the Brussels bureaucracy." We're not so sure. The man is a career eurocrat – he’s been working in the Commission bureaucracy since 1978, including a stint running the EU’s propaganda department, “DG Press and Communication”, between 1999 and 2003. Judging by his CV Faull has never worked in the City or similar in his life. How can he possibly have the interests of the City of London at heart, when his whole career has been about European integration? This is scant compensation for the loss of the influential trade portfolio and the appointment of the protectionist French Europhile Michel Barnier to regulate Europe's financial markets. The Sunday Times reported on the huge payoffs the 13 EU Commissioners stepping down this week will walk away with, on top of the pretty hefty salaries they netted while in office. Open Europe has calculated that the 13 outgoing EU Commissioners have cost taxpayer €2.7 million each. Each one will walk away with an average of €1.3 million in ‘golden goodbyes’ alone. The total bill in ‘golden goodbyes’, including pensions, for those leaving is more than €16.6 million. This is in addition to the €238,919 a Commissioner earns per year, or €1,194,595 over the full five-year term. Vice-Presidents earn €265,465 or €1,327,325 over five years. This does not include other perks such as housing allowances and entertainment allowances, worth between €43,122 and €50,757 every year. One of the biggest winners is Polish Commissioner Pawel Samecki, who has only been in the job six months, but will walk away with a ‘golden goodbye’ of €391,898. This is in addition to the €141,020 he has made in earnings alone. Samecki replaced Danuta Hubner in July this year but has not been re-nominated for the next Commission team. The last Commission mandate, which ran from 2004 to 2009, saw a total of 34 Commissioners in the 27 posts, who collectively earned more than €40.7 million in salaries, housing allowances and entertainment allowances alone – that’s more than €1.5 million for each of the 27 Commission jobs. The highest earners were Margot Wallstrom and Gunter Verhuegen who each pocketed €2,991,313 for their ten years in Brussels. They will each receive annual pensions of €113,486 for the rest of their lives. The newly-appointed EU Foreign Minister Catherine Ashton, who took over as EU Trade Commissioner from Lord Mandelson last year, took home €282,040 in earnings for just over a year in office. In addition to the 13 Commissioners leaving next week, 7 Commissioners have left their posts during the 2004-2009 term. As of next week, taxpayers will have contributed more than €24.3 million in ‘golden goodbyes’ for the 20 outgoing Commissioners – including €988,894 for Lord Mandelson. All this comes on top of news last week that all EU Commissioners and the 38,000 people working in the European Commission bureaucracy are set to receive an inflation-busting 3.7% payrise - in spite of public sector pay freezes in many places around Europe. Open Europe unveiled the extent of Commissioners’ remuneration in March 2009, prompting several telling responses. Asked by the Belgian press about Open Europe’s figures, EU Development Commissioner Louis Michel exclaimed: "if that's true, I'll retire immediately." Belgian daily De Standaard went on to report that, "after consulting an assistant, the message however appeared to be accurate. This was followed by Louis Michel suddenly changing his mind, saying the compensation is completely justified: 'We are being well paid. But every morning getting up at 5 o'clock, lots of travelling, heavy files...This is a parachute but not a golden one.'" Danish Commissioner Mariann Fischer-Boel responded to the figures saying "I'm worth all the millions." Commission spokesperson Valerie Rampi said: "Open Europe didn't discover anything new, it's all public and online... Everyone who has worked as a commissioner is entitled to pension rights, like you and me". She then denied that Commissioners received "golden one-off payments". Despite this implicit confirmation that the figures were correct, EU Communications Commissioner Margot Wallstrom later said in an interview that the figures were “deliberately twisted and exaggerated data.” She went on: "Stepping in office within the European Commission (EC) does not include talks about salaries, allowances and retirement payments. It's the Council of the European Union that decided in the matter and therefore all changes are up to it. The current rules have been around since 1967 and are open to the public." The Commission has just published the new list of EU Commissioners and their responsibilities for the next five years. It looks like the paper obtained by Jean Quatremer which we reported on yesterday got it quite wrong. 1) It looks as though France’s Michel Barnier gets the financial services portfolio as well as internal market after all. Right up to today (Times) reports said that Barroso would remove responsibility from the internal market portfolio and either make a whole new Financial Services post, or put it in with the Competition or Economic & Monetary Affairs briefs. Clearly this is not now going to happen and controversially, the protectionist Europhile Michel Barnier will gain control over financial services regulation. This is a major blow to the UK, in particular the City, which is currently fighting against misguided protectionist proposals for new EU rules over financial services, such as the proposed AIFM Directive (on alternative investment funds). British diplomats have been lobbying behind the scenes to stop this from happening – but they have obviously failed. 2) Also very interesting that they now have a brand new “Home Affairs” portfolio – previously this job was called Freedom, Security & Justice. With all the new powers given to the EU in this area by the Lisbon Treaty, this signals a clear intention to basically create an EU Home Office. 3) Interesting that they’ve got rid of the EU Commissioner for Communications post – it looks like DG Communication will still exist, but there will no longer be a Commissioner dedicated purely to that. Instead it comes under Education, Culture, Multilingualism and Youth. That’s a bit embarrassing for the outgoing Communications Commissioner Margot Wallstrom who has spent the last five years trying to sell the EU to people with this post – and failing. However, no doubt the EU propaganda machine will continue under these other portfolios. By swapping our influential trade portfolio for External Affairs (Cathy Ashton), the UK’s influence in the EU has arguably taken a step backwards. We’ve missed out on all the important economic portfolios, and handed responsibility for the internal market and financial services to a French protectionist – which is the worst case scenario. Brussels is awash with rumour about who will get what in the newly appointed European Commission, due to be unveiled by President Barroso next week. Having ruled itself out of any of the important economic portfolios with the appointment of Cathy Ashton as EU Foreign Minister and Vice President of the Commission with responsibility for External Relations, the UK is now out of the equation. According to the Times yesterday, however, British diplomats have been lobbying behind the scenes to make sure that France's Michel Barnier doesn't bag the influential Internal Market job, including responsibility for financial services. A report in the Telegraph suggests they might actually be getting somewhere. It is now thought that Jose Barroso, will, after all, revert to the original plan and remove financial services from the internal market portfolio, creating a brand new Financial Services post. Problem is, Paris is thought now to be campaigning for the competition job instead - which is only marginally less alarming than the idea of the French protectionist taking over internal market and financial services. And there is more alarming news. Over on his brilliant Coulisses de Bruxelles blog, French journalist Jean Quatremer shares with us a list he has obtained of who is likely to get what. He says financial services will go to Hungary's Laszlo Andor, a former economic adviser to the Socialist party and to the socialist-liberal government. Quatremer says the appointment of the Hungarian to this post would be “a real slap in the face for France”, but notes that a small consolation for France will be the appointment of Romania’s Dacian Ciolos to the agriculture portfolio. Meanwhile, having been in charge of DG Communications for the past 5 years, Sweden has ended up with yet another kum-by-ah post in Human Rights. There's definitely scope for a couple of new versions of this joke involving Team Barroso II. Intruiguingly, there is someone missing from Quatremer's list. What will Malta get? The non-job of Commissioner for Multilingualism? Maybe sport? Or perhaps it will take charge of the €2.4 billion propaganda Communication and citizenship budget? With only one job left to fill, going on Quatremer's list of all the other 26 posts (including Barroso as President and Ashton as Vice President), several of the current portfolios must be heading for the axe, or will be amalgamated into one. Currently, as noted above, Communication is a portfolio in its own right, under Sweden's Margot Wallstrom, while Culture and Citizenship is seperate but, as we've argued before, all very much interlinked with the campaign for hearts and minds piloted by Wallstrom. According to Quatremer, culture will be merged with 'digital economy' under Luxembourg's Viviane Reding. For the past year, we have argued that the Communication post should be scrapped outright, since it has proven unable to provide badly-needed neutral information about the EU and its policies, reverting instead to promoting the EU and European integration at every opportunity. Margot Wallstrom did her best, but it's starting to look as though our wish may be granted and the days of the world's most ineffective PR department may finally be numbered. Fingers crossed. In a letter in the Evening Standard yesterday we argued that the EU's new President, Herman Van Rompuy, should not be underestimated. Just looking through Nicolas Sarkozy's press conference in Brussels last week, this is reinforced. There are a couple of other telling quotes in there too. Tsk - those pesky Irish getting it wrong eh - they "had to be" consulted twice.... ! Yeah, Sarko, just like last week's seamlessly smooth EU summit - what a success that was - not a total embarassment at all... not a monumental contradiction of everything you've been saying about making the EU more democratic, nooo...! A great success, no scandal or fuss at all, we're quite sure the citizens of Europe are all perfectly happy with the whole thing. Number 10 is facing growing accusations that Gordon Brown had 'sold Britain down the river' once again by giving up the influential EU trade portfolio currently held by the UK's Cathy Ashton in return for the arguably less important external relations role. Not only that, but according to French diplomats and a Commission source speaking to Le Monde newspaper, the whole sorry stitch-up was a deal brokered with Nicolas Sarkozy who in return for backing Ashton for Foreign Minister, secured GB's support for French MEP Michel Barnier to bag one of the most important Commission posts of all - Internal Market. “This appointment is part of a very deliberate French strategy to challenge the anglo-saxon model in general and the prominence of the City of London in particular." Because let's be clear: with Barnier in charge of the heaviest economic portfolio in the Commission we’re guaranteed to get two things: more 'Europe' and more regulations. Looks like GB has been outmanoeuvred in Europe yet again. Don't get us wrong - the Foreign Minister role is a definitely a biggy. In charge of up to 7,000 staff and a £45 billion 3-year budget for the "biggest diplomatic service in the world", in the words of current foreign policy bod Javier Solana, Cathy Ashton is being described as the face of Europe on the world stage. But as high-profile as that may be, the key thing to remember in all this is that the UK has now been completely ruled out of every single one of the important economic portfolios in the Commission - Internal Market, Competition, Trade, Economic & Social Affairs, even the rumoured new Financial Services post. In fact, France has made crystal clear that it doesn't want Jose Barroso to separate the financial services side of things from the Internal Market portfolio - meaning Barnier will be in charge of the lot. "Why did the Prime Minister allow himself to be outwitted by the French into conceding the key internal market and financial services job with a result that we will have a French commissioner regulating the City of London whilst Baroness Ashton is handing out the Ferrero Rocher?" All of this is hugely important for the UK because the Commission is now so active in the area of financial and economic regulation - and it is vital the UK has a strong influence. Unless you've just arrived home from Mars, you will know the EU's current proposed rules for alternative investment funds, for instance, could be hugely damaging to the City unless they are substantially amended along the lines being pushed by the UK government and others. Parachuting Michel Barnier into this role could be far more disastrous for the UK than any prestigious appointment to the world stage can hope to compensate for. Why? Because Barnier is a backward-looking protectionist. Most worrying of all, he said: “All problems are local and yet all the solutions are found in Brussels!”. Even left-leaning newspaper Le Monde warned earlier this year that the "europhile" Barnier would be a poor choice for Internal Market Commissioner. It said: “without a doubt the post is currently the most important at the heart of the European executive, after the presidency”. It pointed out that the City of London would view the appointment of a French politician to the Internal Market post as comparable “to entrusting the surveillance of a chicken coop to a fox”. It wisely noted that “the issue of new financial regulation is too serious to become a simple stake in negotiations on the composition of the future commission”. And don't forget, Sarkozy has said that Paris' La Défense district, which according to the FT recently is undergoing a radical makeoever, "intends to take over" the City. Score: Brown 1, Sarkozy 2. In his book “Vernieuwing in hoofd en hart : een tegendraadse visie” (Renovation in Head and Heart: a contrary vision, 1998), for instance, Van Rompuy celebrates the fact that the euro was imposed in Germany even though the majority of people were against it. “If we don’t want to let the global level of taxation sink away, we will have to consciously levy certain new taxes at the European level or harmonise some of these, for example in the field of environment, mobility, income from capital... Every time it will be a movement upwards." See here for Open Europe's reaction to the outcome of yesterday's EU summit. According to the Telegraph the UK's Cathy Ashton was told at 5pm yesterday that she had been put forward for the job. Two hours later she had bagged the job and was celebrating with the other EU leaders, with Jose Barroso handing a Rubiks cube to Sweden's Fredrik Reinfeldt to congratulate him for engineering the whole stitch-up. Can anyone remember the Laeken Declaration, the original impetus behind the original EU Constitution, which later became the Lisbon Treaty? It talked about bringing the EU decision-making process closer to its citizens. What a terrible joke that has turned out to be. Apparently Herman Van Rompuy is still leading the pack as the frontrunner for the EU President job - especially now that Merkel and Sarkozy are doing their best to stitch it up for him. The surprise is that the UK's EU Trade Commissioner, Baroness Catherine Ashton, could be creeping up as a wild card for a late burst onto the summit scene in the role of EU Foreign Minister. With an Ashton/Rompuy ticket, it would mean that the newer member states would miss out - so that could still prove to be a sticky wicket over dinner tonight. The EU Foreign Minister could well turn out to be even more influential than the EU President, with a budget of up to £45bn and a diplomatic staff of 7,000 to wield at their disposal. And this is a candidate who has never run for office in her political career, nor for so much as the President of the PTA (as far as we know): an EU Foreign Minister who has never had to face the electorate nor had experience representing the interests of a single constituent. So in a funny way she is just the person for an unelected and unaccountable job like this. But hang on, why are we surprised at all? Maybe this is her reward for pushing the Lisbon Treaty through the House of Lords when she was leader of the House last Spring. In fact, maybe she had her eye on the cushy new job all along?? Who knows. Wie is die jeugdige Belgische lobbyist? Open Europe's man in Brussels, Pieter Cleppe, has stirred up quite a storm over in Belgium with his revelations about the frontrunner for the EU Presidency, Herman Van Rompuy. Pieter, a Flemish-speaking Belgian lawyer (who also happens to be the nephew of former Prime Minister Guy Verhofstadt) was behind information about Van Rompuy's EU federalist credentials uncovered by the Telegraph on Monday and pursued further by many other papers over the last couple of days. As a result, Ter Zake, Belgium's most-watched Flemish news programme, last night featured a whole piece on Pieter and Open Europe. And for those of you who can actually understand Dutch, Pieter also has an op-ed in Belgian daily De Morgan today. The final countdown is on to the summit tomorrow that will decide who will be Europe's first permanent President and Foreign Minster, and the media is awash with speculation on the various candidates. Looking at all the hoo-ha it is entirely possible that the decision making could drag on until Friday, or even the weekend if the Swedish EU Presidency fails to hammer out a consensus. The Times quotes Cecilia Malmström, Sweden's Europe Minister, saying, "I would not say it is a complete mess, but there is no agreement still." 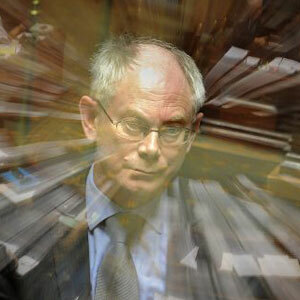 Presumably the revelation that the front-runner for the job, Belgian PM Herman Van Rompuy, is a groaning EU federalist and champion of direct EU taxation might have gone some way to dampening his star - (although we won't hold our breath). With so much secrecy surrounding the process (who's a candidate, who isn't?) and the inevitable horse-trading that goes with any move to hand out plum EU jobs like these, it's really difficult to predict what we're going to end up with. As Martin Winter from Sueddeutsche Zeitung said on the Today programme this morning: "It's the first time in ten years that I have no idea what's going to come out of this summit." All this is an absurd illustration of how out of touch and anti-democratic the EU now is. The EU President will simply be wheeled out at some point over the weekend, with the 500 million citizens he or she is meant to represent expected just to hang on and wait for the outcome. Soon to be your President? There's some interesting background on the frontrunner for the Presidency of the European Union, Belgian PM Herman Van Rompuy. Last week, he laid out his views on how the EU’s budget should be financed in the future at a dinner of the secretive Bilderberg group, pleading for direct EU taxes. And as noted by the Telegraph yesterday, he was an architect of the Flemish Christian Democrats’ federalist manifesto, which calls for more EU symbols in town halls, schools and sporting events. The story is also picked up in Belgian daily De Standaard today. The manifesto says: “Apart from the euro, also other national symbols need to be replaced by European symbols (licence plates, identity cards, presence of more EU flags, one time EU sports events”. "Of course CD&V - Christian Democrat Party - would have wished for a bit more with regards to making decisionmaking procedures in the Council easier, in the field of social and fiscal policy and in the field of foreign policy. But because politics is the art of the possible, we think the text of the Convention is a great success." Furthermore, Van Rompuy's manifesto pleaded for a social Europe - wanting Europe to "formulate social minimum norms”, and calling for the things that ended up in the Lisbon Treaty: the removal of veto powers for Justice and Home Affairs legislation, an EU Prosecutor, and a harmonised asylum policy. Last but not least the manifesto notes that "taking decisions by majority needs to become to rule, also in domains which are traditionally very closely connected with national sovereignty, such as justice, internal affairs, fiscal matters, social policy and foreign policy." Van Rompuy himself was an avid supporter of the European Constitution, and is reported to have been very relieved that there was no referendum in Belgium. He reportedly hated the debates in France and the Netherlands, in which he discovered a sort of demagogy to which “even the calculating citizen lends a willing ear”. Following the No votes to the European Constitution in 2005, Van Rompuy gave a speech to the Belgian Parliament, in which he said: “We go on with the ratification of the European Constitution in all our parliaments, but we need to admit that for the moment the project is over. However, this doesn’t mean that we cannot continue to work in a creative way in the direction which the Constitution points. I don’t mind if we break up the Constitution into smaller parts, as long as we continue to work in the same direction: in the direction of more Europe.” And so it was. Van Rompuy is an avid supporter of an EU superstate. In 1998 he said: “European harmonisation, which is being imposed through a unified currency, is running smoothly. Only fiscal harmonisation will still demand a lot of effort” (De Morgen, 28 maart 1998). (As Speaker of the Belgian Parliament, Van Rompuy once cancelled a session of the Belgian Parliament, on the instigation of the PM. It sparked much commotion, especially as the locks of the plenary session room had been replaced, leading furious opposition MPs unable to get in to claim this was a 'coup d’Etat' and “this is Belgicistan! "(De Morgen, 3 May 2008)). Interestingly, he criticised former Belgian PM Jean-Luc Dehaene for wanting to leave Belgium in 1994 to become EU Commission President, saying: "I was furious at Dehaene when he wanted to go to the European Commission. I have sent him a letter twice, hopefully for him he has thrown it away. I did not want it and I found it a shame that he would leave us in the lurch." (De Morgen, 11 February 2006). Is he about to leave Belgium in the lurch too, and fulfill a wish to become EU President? Van Rompuy seems pretty good at doing the opposite of what he has pledged. In 2007 he warned: “I know that some are contemplating having a Belgian Federal government backed only by a minority of Flemish MPs in the Belgian Parliament. A government which only has a majority in Wallonia is playing with fire. I am now speaking in the interest of the country: this is dangerous for the sake of the State” (De Morgen, 27 januari 2007). One year later he was and still is the leader of such a government. The fundamental problem of waste and mismanagement involving EU money lies primarily with the budget itself...Mismanagement and waste in the EU budget are two sides of the same coin. They both stem from the size, complexity and irrational nature of the EU budget. Both receive their thrust from the blurred line between spending and accountability, owing to the set-up of the EU's budget programmes. And both can be radically reduced by simplifying the budget, cutting down on the spending and by repatriating a large chunk of regional spending and the CAP to member states. fully repatriating regional policy to the member states except those with a GDP of less than 90% the EU average (which would target the funds on the poorer member states where the money actually can have a real impact); repatriating all parts of the rural development programme which are not related to promoting the environment (as the environment is inherently a cross-border issue); and establishing a better link between performance and receipt of subsidies. We also pick up on Commissioner Kallas' insight that: "One cannot reasonably expect an EU official from an office in the Commission's headquarters in Brussels to know what best fits the needs of a small town in the West Midlands - this is for the local authorities to say." We fully agree. So why then are regional spending and rural development a matter for Brussels in the first place? Simon Jenkins' piece in today's Guardian gets a big thumbs up from us. The article suggests why Gordon Brown would make a good EU President arguing that "He [Brown] is clearly unhappy with the rough and tumble of democratic politics, with the daily grind of public appearances, glad-handing and schmoozing. But these are not required in Brussels, where nobody is elected to anything and such populism as smiling at cameras and holding referendums are anathema." "An inability to think laterally has long been the curse of the European movement. A sign of its intellectual insecurity is that it cannot handle scepticism, treating any but the most craven sycophant as an enemy...Brussels is like an office of the doctrine of the faith, tolerating no Francis of Assisi. Criticise it and you are damned as anti-European." Jenkins also points out that the debate is so polarised that scepticism of the EU can easily be pigeonholed at the other extreme. "The noble word, sceptic, has become code for rejectionist," he says. "The language of the Lisbon treaty is that of an elite of 40 years ago, a smokescreen for the accretion of establishment power. David Cameron is right to keep open a determination to change it, as is indeed allowed by the treaty. The only sensible response to Lisbon is not rejectionism but a ferocious scepticism, properly so called." And so ex-UKIP MEP Tom Wise has been jailed for fraudulently claiming £39,000 in allowances from the European Parliament. He used his monthly staff allowance to pay for "fine wines" and other personal expenditure. His researcher, Lindsay Jenkins, was cleared of all charges after Wise admitted that documents he had her sign were blank at the time. Just a thought - but does anyone out there know if any movement has been made to reclaim the £538,290 in "unduly paid" expenses that Den Dover owed the European Parliament when he was awarded a medal from the very same institution for his "vital contribution" as his term came to an end in the summer? The European Court of Auditors has, for the 15th year in a row, today refused to sign off the EU's accounts. But, as we argue today in a new briefing, the problem is with the EU budget itself. It is dominated by two failing policies which even the current UK Government is essentially opposed to: the Common Agricultural Policy, and the so-called Structural Funds. The sheer size and complexity of these two top-down spending programmes means the EU's budget is wide open to waste and mismanagement, regardless of whether the blame lays with the Commission or the member states. The budget therefore represents extremely bad value for taxpayers' money. Over at Conservative Home today we lay out our response to David Cameron's announcement that he will bring control over social and employment policy back to the UK. This is the most welcome aspect of his new 'Europe policy', but on close inspection, his language suggests he is not contemplating going as far as he should in order to make this a success. Ahead of David Cameron's announcement on Conservative policy on Europe, Open Europe has today published the first in a series of papers about what a future Conservative government should prioritise, now that the Lisbon Treaty has been ratified. In about two hours time Cameron is expected to announce that he will seek to 'repatriate' social and employment legislation from the EU, and promise a referendum on any future transfers of power. Open Europe argues that, if the Conservatives are serious about repatriating powers to member states, then social and employment policy is exactly the right place to start. However, in order to achieve a strong negotiating mandate and fully address the current problems with EU social policy, the Conservatives must announce a referendum on reform of the status quo. A referendum on future transfers of power will do nothing to address the substantial costs already arising from EU legislation, nor the lack of democratic accountability in this area. EU social and employment laws have had a massive impact on the UK economy, accounting for 25 percent of the total cost of regulation in the UK over the past decade. Looking ahead, UK laws derived from EU social legislation will cost the British economy more than £71 billion between 2010 and 2020, even if no new laws are passed in that time. In the briefing paper, Open Europe sets out how the Conservatives should go about achieving repatriation in practice. This includes seeking a strong mandate from voters to strengthen the UK's negotiation position in Brussels, through a referendum on reform. The potential election of a new Conservative government will coincide with the opening of EU budget negotiations, where discussions will be held about how much each country should pay into the EU over the period 2014 to 2020. The UK has a veto over these negotiations, and should be prepared to use it to fight for a package of reforms which must be fleshed out between now and the election. A major feature of such a package should be repatriation of social policy. This package of reforms should be put to the British people in a referendum, with a question along the lines of: "Are you in favour or against withholding agreement to the EU budget until the European Reform Package has been adopted?" "Given the substantial economic impact of these laws, the Conservatives are absolutely right to make EU social policy a priority. There is a strong practical, economic and democratic case for repatriating powers in this area." "If the Conservatives succeed in bringing back powers over these policies, it doesn't mean scrapping every workplace right going - it means giving Westminster back the power to keep, scrap or amend these important laws to better suit the UK's individual economic circumstances. This would cut costs and bring these decisions much closer to the people - where they belong." "Employment policy is best decided nationally, where it reflects different traditions and labour market models, which have evolved as a result of decades of democratic discourse in individual countries. The Conservatives would not be alone in Europe in arguing that centralised rules for such fundamentally different labour markets just don't make sense." "That said, they will need a powerful mandate for negotiation in Brussels, and holding a referendum on a list of reforms, such as repatriation of social policy, is by far the best way to achieve it. UK voters must get a say on the future of the EU - a mere 'manifesto mandate' simply will not cut it." President Klaus has signed the Treaty and David Cameron is expected to make an announcement at 4pm tomorrow about what he will do next. There's zero chance he will call a referendum on the now-ratified Lisbon Treaty (to come into force by 1 December), but he must still pledge to hold a referendum on reform of the EU. A referendum on future treaties simply will not cut it, since Lisbon allows for EU integration to take place without the need for further treaties, and a mere 'manifesto mandate' to EU reform is woefully inadequate - poll after poll shows the vast majority of voters from all parties want to be consulted. Yes, it was Labour and the Lib Dems who got us into this mess by reneging on their promise of a referendum, but the Tories must now do the right thing and give the British people a say on what is feasible and realistic - a package of reforms which they could seek to lever in using upcoming negotiations on the EU budget. Following President Klaus' signature of the Lisbon Treaty today, Open Europe calls on the British Conservative Party to now pledge to hold a referendum on reform of the European Union. The UK has a veto over these negotiations, and should be prepared to use it to fight for a package of reforms which must be fleshed out between now and the election. This Reform Package should be put to the British people in a referendum, with a question along the lines of: "Are you in favour or against withholding agreement to the EU budget until the European Reform Package has been adopted?" Tomorrow, Open Europe will publish the first in a series of papers looking at which policy areas the Conservatives should propose to tackle, and how. The first paper will look at EU social and employment policy, which currently accounts for a staggering 25 percent of the total cost of regulation in the UK. "Now that Lisbon is a done deal, the Conservative Party must pledge to hold a referendum on EU reform. They must not follow Labour and the Lib Dems and go back on their promise to give people a say on the future of the EU." "The public are crying out to be consulted. The Conservatives should now announce a referendum on a package of meaningful EU reforms which they should draw up carefully over the next weeks and months. Linking their ideas for reform to the EU budget, a Conservative government could be in a strong position to work with key allies in Europe for a better, more democratic and modern European Union." "A simple 'manifesto mandate' for these things will not be enough - people want their long overdue say, and the Conservatives should give them it. A strong mandate from the people will strengthen the Conservatives' position in Europe when the time comes." The Prime Minister has delivered a statement to the House of Commons regarding last week's European Council meeting, with more than a few questions directed towards him regarding the hoo-ha surrounding Tony Blair's candidacy to be the EU's first permanent President. A question from Labour MP Ian Davidson made reference to the news this morning that the Conservatives have indicated they are unlikely to 'un-pick' the Lisbon Treaty via a referendum if it has already been ratified. He suggested that those who "capitulate" on their pledges betray the promises made to the British people. Quite extraordinarily, Gordon Brown seemed to agree with him, and said that David Cameron had made a "cast-iron guarantee" to hold a referendum, and that it was now up to the leader of the Opposition to make his position on the Lisbon Treaty known. 12 May 2004: "If we secure a treaty that is acceptable for Britain, then i believe we can also put it successfully to the British people." 24 June 2007: "The manifesto is what we put to the public. We've got to honour that manifesto. That is an issue of trust for me with the electorate." "The new Constitutional Treaty ensures the new Europe can work effectively...We will put it to the British people in a referendum." This has a very strong and ugly odour of the pot calling the kettle black. We've written an article for the Guardian's Comment is Free looking at the themes in our latest report on the EU's surveillance state and the Government's complicit role in its rise.